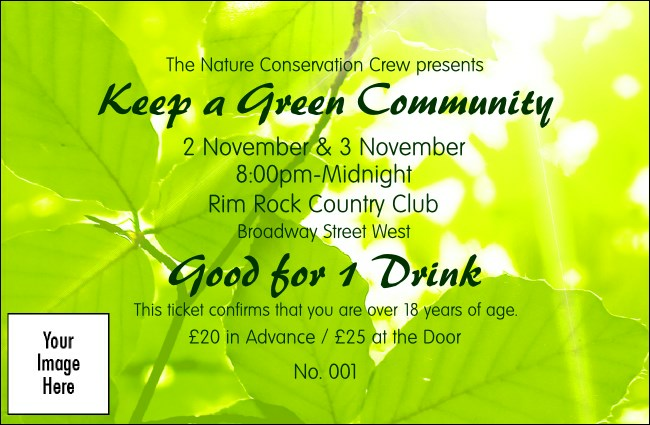 Whether you're planning a day hike through the forest or a serious fundraiser to benefit the environment, you're thirsty guests are bound to appreciate the Green Leaves Drink Ticket. With beautiful photorealistic images of leaves, individual numbering and space for a custom image, this ticket is the proper choice for your event. Enjoy nature from the comfort of your computer when you browse the design gallery at UK Ticket Printing.